As a big historical and fantasy nerd, I had extremely high expectations for Ubisoft’s latest venture, For Honor. Let’s get one thing out of the way: Vikings are really cool, Samurai are also really cool and to round it up, Knights are - you guessed it- really cool. All three of those things in a game with an unashamedly shaky explanation as to why is the stuff of nerd dreams. One of the best things about this game is the effort that has gone into making each character unique and with a distinctly different playstyle. There’s something for everyone in here, whether you want to play as an agile assassin-type as the Peacekeeper or a defensive tank as the Samurai Shugoki or absolutely everything in between. There is also a game mode to suit all tastes. 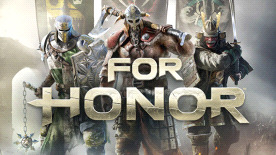 The 1v1 and 2v2 duel modes are a more intense experience and will be great for the purists who want to hone their skills and enjoy the best the For Honor combat system can offer. Dominion and Deathmatch 4v4 modes add more variety to the game, introducing capture-points and an array of special abilities and opportunities for teamplay – this does often mean getting ganked by 3 people, or conversely, descending en-masse on your pathetic enemies to do the same. I fall more on the purist duel-mode preference but even so, Dominion provides a welcome change of pace to the duels and there can be few things more satisfying in any game than winning a fight against 3 opponents to win the match. There are, to be sure, a few flaws in this game. There have been some complaints about the peer-to-peer hosting system and there will be an ever-present challenge to keep the game balanced and fun to play as meta-playstyles emerge. As a player of Rainbow Six: Siege, I really trust Ubisoft to get these things right over time because they did (and are still doing) a fantastic job there with the same model.I’m incredibly excited to see what new characters, events and other content they throw out over the year and was confident enough to buy the Season Pass and know that For Honor will deliver. For now, I’m having a great time playing For Honor and I’d really recommend it to anyone. I’ll see you on the battlefield and please, please don’t throw me off a bridge if you find me. LEGAL: © 2016 Ubisoft Entertainment. All Rights Reserved. Ubisoft and the Ubisoft logo are trademarks of Ubisoft Entertainment in the US and/or other countries.